"Incredibly moist cake is also great for muffins. Very light-it will disappear very quickly." Pour boiling water over oats and bran cereal, and let stand 10 minutes. Combine the remaining ingredients, and add oat mixture to them. Pour into two 8 or 9 inch pans. Bake at 350 degrees F ( 175 degrees C) for 30 to 40 minutes. 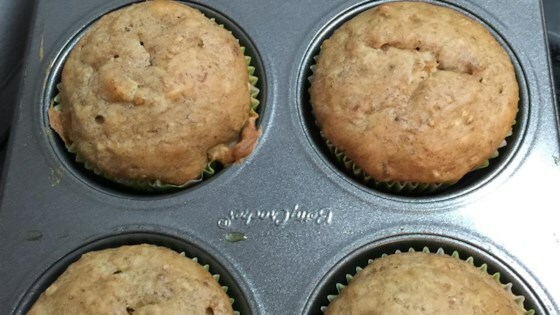 To make muffins bake about 15 minutes, or until toothpick comes out clean. Moist and light. I substituted the shortening with vanilla yogurt and a tbsp of oil, and it turned out great too. Great low-carb recipe! I added rasins. Don't worry when the mix feels really thick - as soon as you add the oatmeal & bran it becomes a perfect batter. Plenty sweet and moist. This was great--very moist and I loved the texture from the bran and oatmeal. I added a tsp of vanilla like others suggested. Also, I used quick oats and regular All Bran.